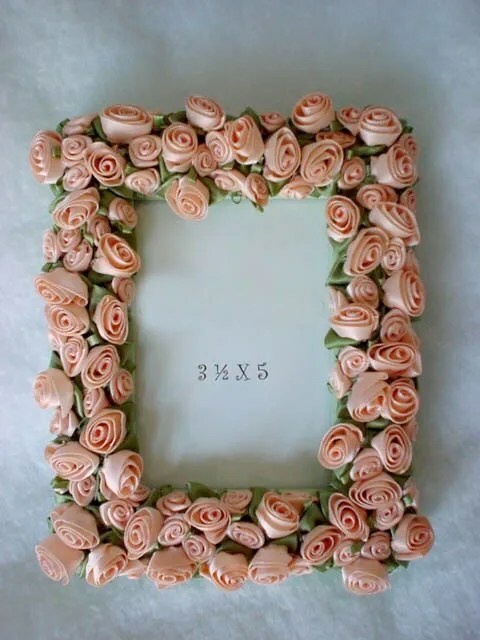 I had a favorite picture in a little porcelain frame….. I forget what the picture was… but this was back in the day when you had to get your pictures developed and printed by the professionals at your local drug store. Somehow the picture stuck onto the glass of the frame… so when the frame cracked… I couldn’t remove the picture without destroying it. Meanwhile (back at the ranch..) I had all these ribbon roses lying around… and well, it was just a natural crafting progression. The results turned out fabulous so I made some more. After taking a few orders, I started selling them at a booth at the Studio City Farmers Market. I sold a ton of those things there. Picture frames make great presents (especially with the long awaited wedding photo, baby photo inserted)! For those of you who still love all things Shabby Chic, girly or diva…. this little project is just right for you. For a 3 1/2 X 5 frame you’ll need approx. 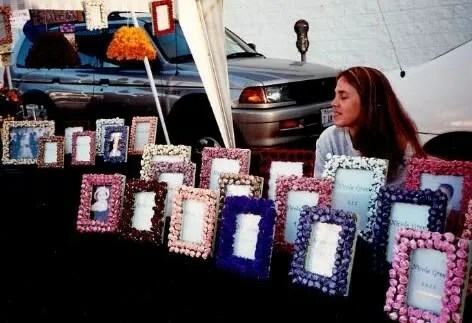 Find a picture frame. Find a GOOD one. One with a nice backing. One with a flat smooth detail free front (mine actually are softly rounded and that works great). 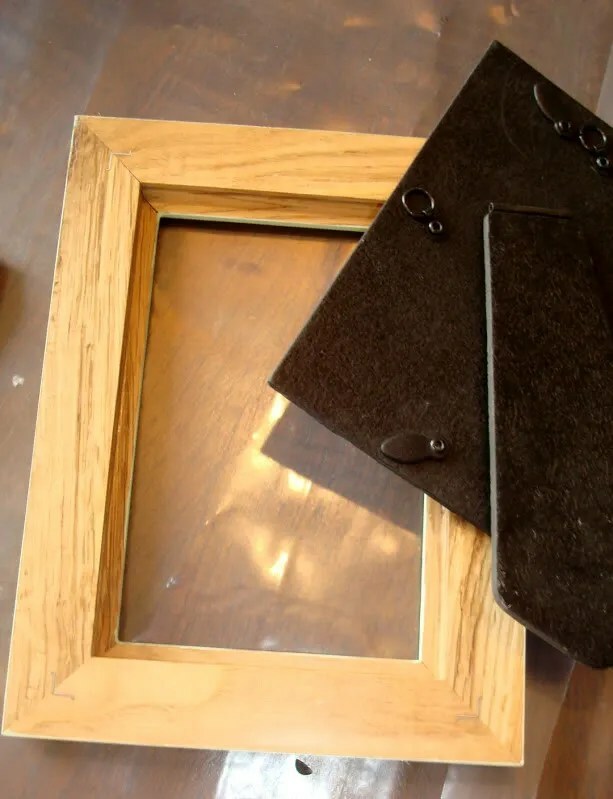 Remove the backing and glass from the picture frame. 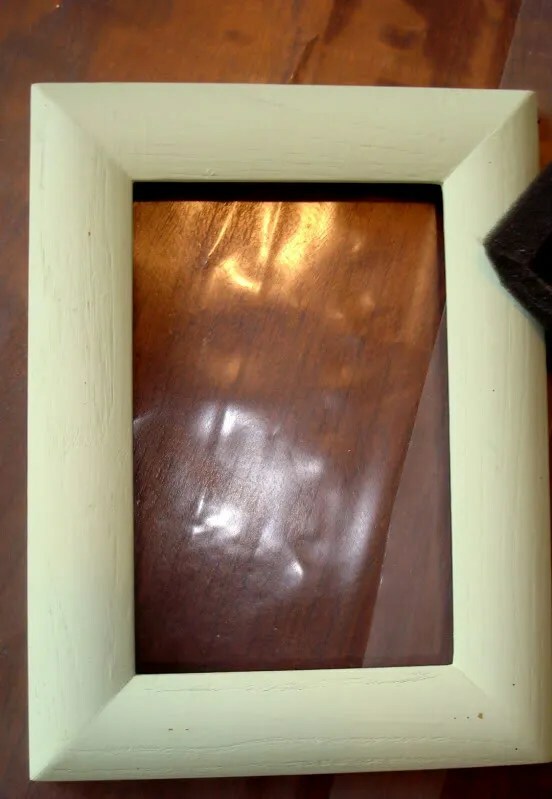 Lightly sand the picture frame to remove any coating and apply thin coat of primer to the wood frame. Dry and paint with two coats of main color. I actually had a paint color made to match the color of the little leaves that come attached on the ribbon roses. Green is a neutral color and the eye is going to dismiss this color, picking up the color of the ribbon roses instead. But do what you want. Replace the glass, ad a fabulous photo and fasten the backing. Gorgeous! They make excellent frames for wedding photos or babies rooms. I once whipped out 25 of these as wedding favors for a bridal party. I’ve even made mini ones and attached little eye-hooks to adorn the Christmas tree!